A meeting between Prime Minister Binyamin Netanyahu and Russian President Vladimir Putin Monday afternoon ran longer than expected, and in a joint press conference after the meeting, Netanyahu and Putin said that they hoped the two countries could cooperate more closely in a wide range of areas, especially high-tech, agriculture, and science. Putin was in Israel for his first state visit since 2005. “Mr. President, you have arrived in Israel at a time of great regional change,” Netanyahu said at the press conference, referring to the declaration of Mohammed Morsi as President of Egypt on Sunday. “Israel respects the democratic election process in Egypt. I believe strongly that peace is necessary for Israel and Egypt, and it is a basic requirement for regional stability,” the Prime Minister said. Netanyahu also discussed the negotiations between Israel and PA, saying that “we all want peace. I am interested in discussing with you how Russia can help us and the Palestinians move forward towards peace. Tomorrow you will meet with PA chief Mahmoud Abbas in Bethlehem, a four minute trip from here in Jerusalem. The key to peace is complicated, but it is also simple. Either he comes here or I go there. But we must begin talking,” Netanyahu said. Netanyahu also discussed Israel's desire to work more closely with Russia in the areas of high-tech and science, and in his remarks Putin picked up on this theme, dedicating most of his remarks to describing a vision of cooperation between the two countries in a number of areas. With that, he called on Israel and the PA to return to the negotiating table. 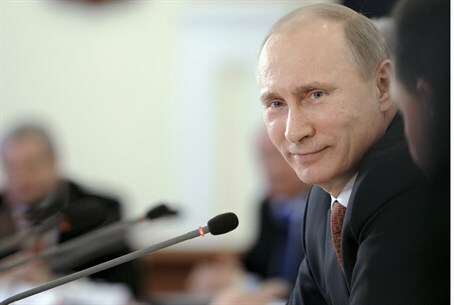 “I am sure that further cooperation between our two countries will continue and develop,” Putin added.